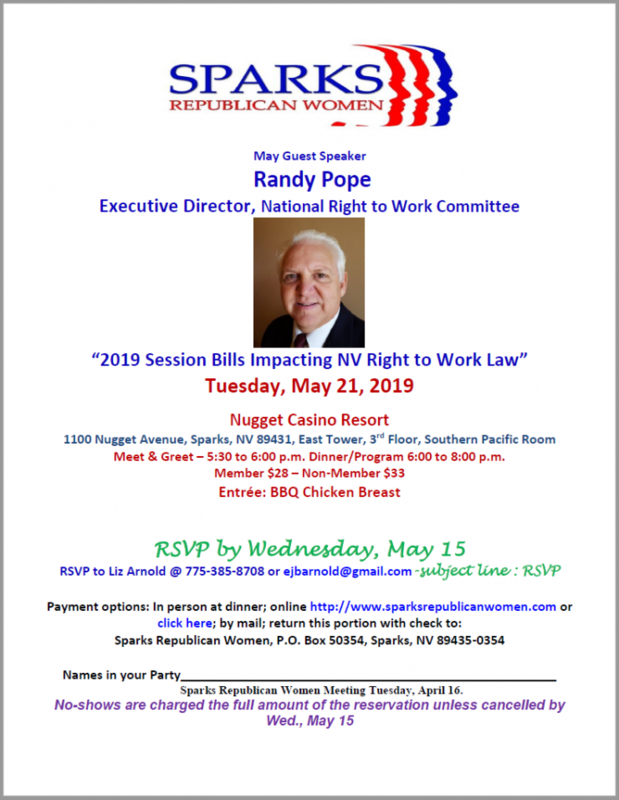 The mission of the Sparks Republican Women is to educate and inform the public on Republican philosophy and the objectives and policies of the Nevada Federation of republican Women and the National Federation of Republican Women. "Increasing the effectiveness of women in the cause of good government through political participation & activism." Sparks Republican Women was chartered by the Nevada Federation of Republican Women and the National Federation of Republican Women in January 2006. The focus of our club is to educate, inform, and develop relationships and friendships with Republican women. Our monthly meetings are held on the third Tuesday of each month, where we have fantastic guest speakers on relevant topics. We have a monthly newsletter to keep members updated with current information and timely e-mails are distributed on hot topics. We are looking for women who care about their community, are interested in issues that affect all of us, and want to learn more and get involved with our candidates and our Party.